Where is the impedance (or ohm rating) for the first speaker, for the second, and so on, for every speaker in the chain. This equation calculates the total impedance of the speaker system, which should NOT be lower than the minimum impedance rating of the amplifier. This equation may be used to calculate the equivalent impedance for additional speakers in two-speaker increments. Determine the impedance of the first two speakers, substitute Z total for Z , and include the next speaker. Repeat the process until all speakers have been included. The result should be the same as with the first method. 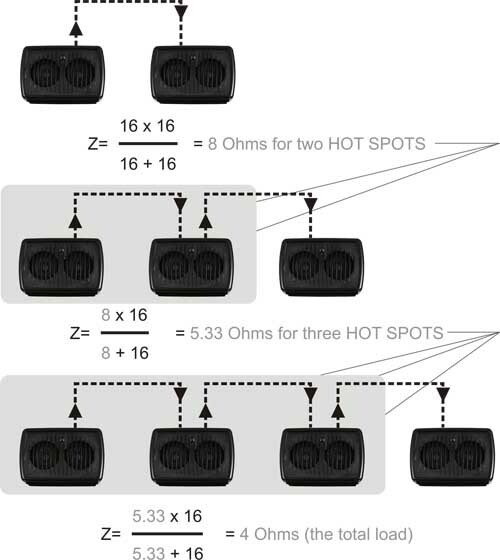 A word of caution: polarity rules must be observed when connecting multiple speakers. Polarity will not affect the Z, but can affect the quality and volume of the sound. If you are having problems with any of these applications use Galaxy Audio’s CRICKET Polarity and Continuity Test Set to check the polarity of your cables. As long as all of the speakers have the same impedance rating, the equivalent impedance of the system is the rated impedance of one speaker divided by the number of equivalent speakers.